Ayesha McGowan aims to be the first ever African American female pro road cyclist. She spends many of her days traveling, heading to different races. 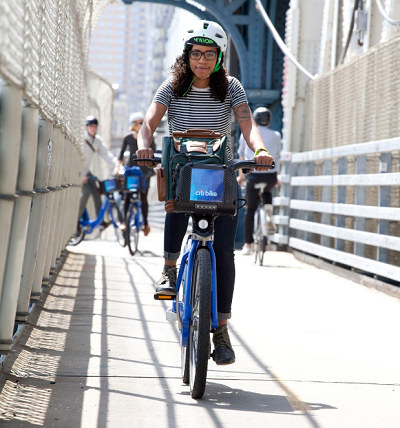 Along the way, Ayesha has had the chance to try out a number of bike share systems, and she shares those experiences today. I love bicycles. I love riding bikes, fixing bikes, talking about bikes, teaching folks about bikes, and racing bikes. I also LOVE travel. In recent years, I’ve been finding ways to combine those two loves for double the fun. One of my favorite ways to navigate a new place is by using their local bike share. Bike share is great for locals — you can use it for your daily commute, or save on a gym membership and ride around for fitness. It’s also great when you’re a tourist! 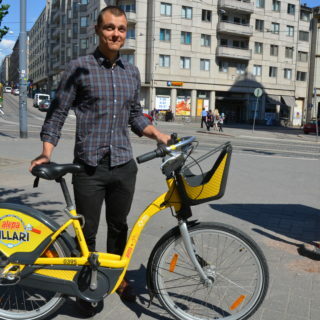 I’ve had the pleasure of using bike share in Paris, Portland, NYC, DC, Chicago, and Atlanta. It’s great when I have my race bike and want to go somewhere that locking it up isn’t an option. It’s also great for when the trains don’t quite go where I need them to, or when a cab or carshare doesn’t really makes sense. More than anything, it’s fun. 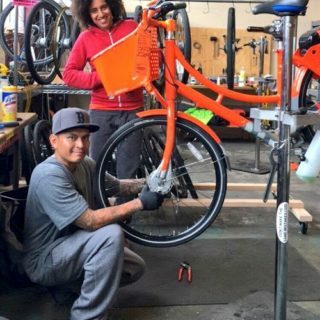 Bike share is an incredible resource in the traveler’s tool belt, and cities all around the world have been constantly improving their bike infrastructure to make bike share an increasingly more viable option every day. I rarely travel purely for vacation, so in addition to exploring, I often use bike share to run errands and travel to meetings. Here a few of my favorite bike share adventures! 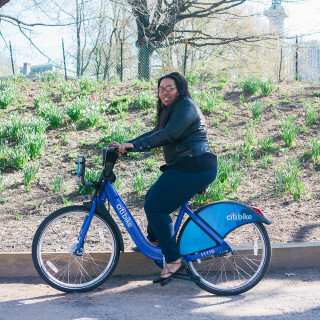 The first bike share I used was Citi Bike. I was living in Brooklyn when it launched, and I remember there being vicious attacks for months against the idea of bringing bike share into the city. Folks were convinced it would destroy the city and everyone would die. No such thing happened. It was not without its kinks, but Citi Bike managed to expose thousands of New Yorkers to the marvel of bike share. One evening, my partner and I wanted to go to a Goldsprint competition in Chinatown. It seemed like a perfect opportunity to utilize Citi Bike. We walked the two blocks from our apartment to the station, adjusted the saddles, and started the journey. We made our way through Brooklyn toward the Manhattan bridge. It was a beautiful evening, and as we descended into Manhattan, we were laughing and smiling and having an all-around great time. The best part was that we got to do it all again on the way back. After an intense season of racing and world travel, I had the opportunity to cat sit for a friend in Paris. If felt like I had the city mostly to myself, as the majority of Parisians were on holiday. A college friend of mine was also in town and he’d never seen Louvre. Vélib’ was clearly the move. I rarely use a subway system when I can instead have access to all the sights and sounds of a city above ground! We admired the French architecture, crossed the Seine, and masterfully navigated the iconic European traffic circles. We had a blast riding through the streets and found premium parking at a station just outside of the Louvre. It was such a nice way to re-connect to the simplicity of using bikes for transportation after going full speed in bike races all year. I was in between midwestern races and found myself staying with a friend on the South Side of Chicago. She asked if I wouldn’t mind going to the locksmith to make a copy of her apartment key. I had my race bike with me and never feel comfortable locking it, so I decided to use bike share. That day I learned that a city block in Chicago is NOT the same length as the city blocks I was accustomed to in NYC. Using my trusty friend Google, I navigated my way deeper into the South Side. I’d calculated that the trip would be too long to use just one bike and mapped out a station along the way to make a switch before the time limit. I made my way to the locksmith, where they informed me that they couldn’t copy that particular set of keys. It was disappointing news, but I wasn’t too upset because I’d spent my afternoon cruising through a part of Chicago, and I had a really fun time. I made my way back to her apartment, we worked out copies of the keys later, and all was well in the end. In 2018, my Representation Matters workshop proposal was accepted for the National Bike Summit. I didn’t have time to attend the entire conference, but I didn’t want to pass up an opportunity to share my workshop with conference goers. I booked a flight into Baltimore, which is located about an hour away from D.C. From there, I hopped on an Amtrak train to Union Station and rode a JUMP dockless e-bike to the conference hotel! This method was more cost effective than flying directly into D.C., and honestly way more fun! This was my first time on an e-bike, and I was having so much fun that I got a bit turned around on my way to the hotel. It was fine because, as usual, I was having fun on a bike, so not much else really mattered at the moment. I loved the ability to park just outside of the hotel, as I would have if it were my own bike. That was the day I became a fan of both e-bikes and dockless bike share. Just thinking of how useful bike share has been in my own adventures, I like to imagine how helpful it could be to others if they considered using it during their own travel excursions. Next time you’re in a new place with bike share, I urge you to give it a go — it might end up being the most memorable experience on your trip! For more about me and my adventures, you can find me at www.aquickbrownfox.com or @ayesuppose on Facebook, Instagram, and Twitter.